Delaware’s dairy industry is a vital segment of the agricultural economies of both the state and the nation. In Delaware, milk sales rank fifth in agricultural receipts and top the income of all livestock products except poultry. The College of Agriculture and Natural Resources at the University of Delaware has a long history of innovative research and rigorous teaching programs in dairy science. The dairy science research, teaching, and extension programs of the University of Delaware work cooperatively to integrate the findings from basic and applied research into cost-effective management practices for the dairy industry in the Northeast region, nationally, and abroad. 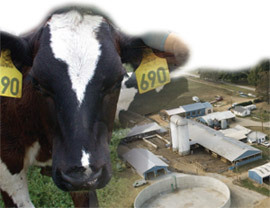 For statistics on the dairy industry visit the USDA National Agricultural Statistics Service website.